It looks cold and lonely in right field for Shane Victorino. In the late innings of the Red Sox 7-4 win over New York last night, the temperature had dropped down into the mid-30's in the Bronx. 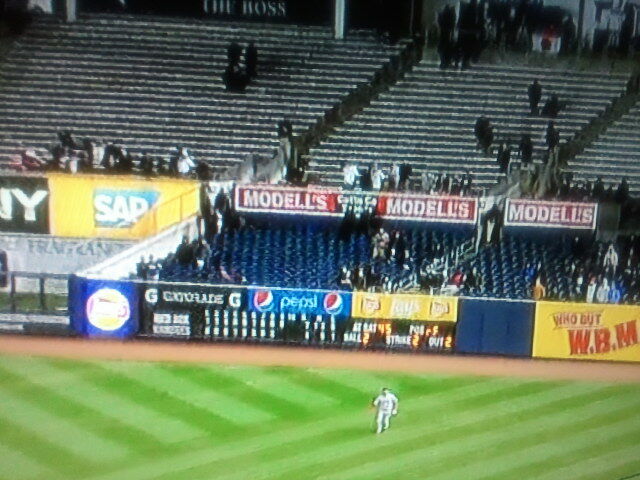 There were about 14 people left at Yankee Stadium. Even the announced crowd of 40,216 at the start of the game was the smallest to attend a visit from the Sox since May of 1999. Boston's starter Clay Buchholz said it was the coldest he'd ever been while pitching, and compared the feel of the baseball to throwing a pool cue ball. In between innings Buchholz also left the dugout and retreated to an indoor batting cage, where he threw to stay warm. I just don't get it. MLB does not need to have games in New York or Boston for the first couple weeks of the season. Even just playing within the division they could begin the year in Tampa, Baltimore, or indoors in Toronto. I wrote more on the stupidity of starting baseball in cold weather cities two years ago. 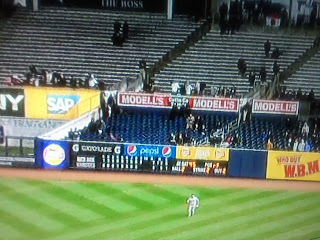 I'm also opposed to the Red Sox vs Yankees Opening Day matchup in general, because I think it's waste of a big game. And while I'm digging up old posts from the spring of 2011, I meant to link to this the other day as well; my favorite April Fool's Day joke.